The computer system consisted of two units - EC362 and EC372 - that could be used independently or linked together to provide a complete system for computer education. To enable the input of relatively long programs and the output of computed results, an ASR33 Teletypewriter with 8-hole punched paper tape input and output was connected to the two linked units. In addition, a textual output was printed on an 8 inch (200 mm) wide paper roll. Unit EC362 was the Arithmetic Unit and unit EC372 was the Core Store and Control Unit. Both units had the same physical size (about 1m high x 600mm wide x 600 mm deep) and the large size allowed the units to be used in a classroom, either singly or jointly, in a demonstration mode. 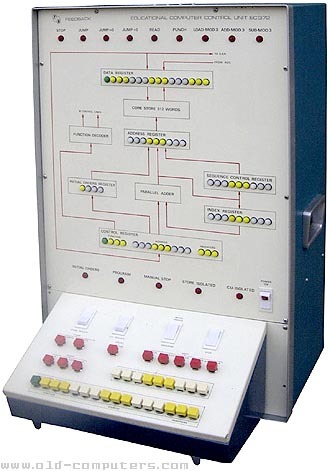 Each unit had a removable, push button, input console connected to its parent unit via a long connector. This feature allowed input and control of the units at the same time as allowing students a full view of the mimic diagrams on the front of the units. The lamps on the mimic diagrams could be arranged in groups of either three or four yellow and white lenses. This feature provided the opportunity to use OCTAL coding or HEXADECIMAL coding without having to make wiring changes. The use of different groupings of the coloured push button key tops provided the same facility for input coding. Behind each of the removable consoles was a set of switches that were used to insert predetermined fault conditions to allow the teaching of faultfinding procedures. Special thanks to Brian Townsend who gave us this venerable machine. see more Feedback ABACUS Educational Computer Ebay auctions !